Xenia quarterback Christian Severt (5) hands off to running back Sincere Wells (32) in the first half of Friday’s Sept. 7 home game against Franklin. Severt threw for two touchdowns while Wells ran for three others in the Bucs’ 35-26 win at Doug Adams Stadium. Xenia defensive lineman Sam Lockwood (54) and linebacker Nick Willis throw Franklin running back Matt Centers for a loss, in the first quarter of Friday’s high school football game at Doug Adams Stadium. Xenia’s Kevin Johnson finds a big hold in the Franklin Wildcats’ defense, in the first half of Friday’s Sept. 7 game at Doug Adams Stadium. Johnson ran for 80 yards, all in the first half of the Bucs 35-26 win. 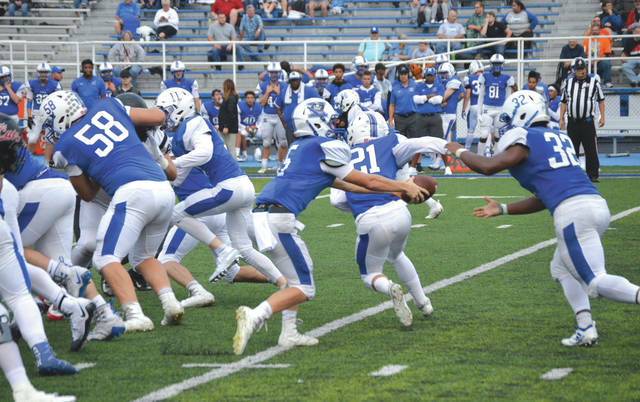 XENIA — Sincere Wells ran for a season-high 252 yards and scored three Buccaneers touchdowns, and quarterback Christian Severt tossed for two scores, as host Xenia fought off a Franklin comeback to win 35-26, Friday Sept. 7 at Doug Adams Stadium. Xenia (2-1) appeared to have the game well in control through nearly three full quarters of play. With Severt’s pass to Markus Allen for a 22-yard scoring play, the Bucs had what appeared to be a comfortable 28-7 lead over the Wildcats with 24 seconds and the fourth quarter left to play. Franklin (0-3) did not roll over and play dead, however. ‘Cats senior quarterback Jake Bowermaster, who had entered the game in the second half in place of Braden Woods, opened up the fourth quarter with an eight-play, 51-yard scoring drive inwhich Woods himself scampered in from 3 yards out for Franklin’s second score of the night. A bad snap prevented the extra point from being attempted, but the score was now 28-13 in Xenia’s favor. With 9:17 left to play, Franklin tried and succeeded kicking an onside kick. And just one play later, Wildcat senior running back Matt Centers ran right, then cut left for a 30-yard touchdown run. Cooper Daniels’ extra point was good and the ‘Cats were now down by one score, 28-20. Xenia’s Wells then did the improbable on the team’s first play after Franklin’s score: he fumbled. Franklin’s Austin Mattox came up with the ball on the Bucs’ 29-yard line and the Wildcats were back in business. Despite a pair of holding penalties, and aided by a Xenia roughing the quarterback penalty that kept the drive alive, Franklin went those 29 yards on eight plays for another Bowermaster QB run for a score. 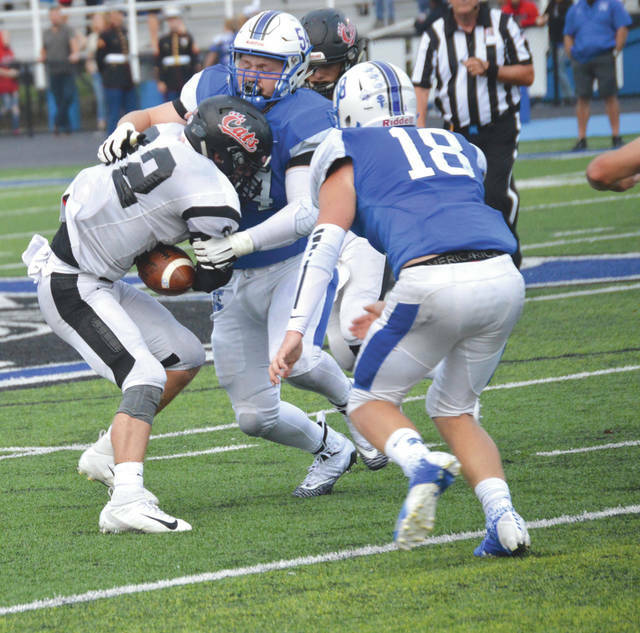 The Wildcats tried a potential game tying two-point conversion run to the left, but Ryan Russell was stopped well short of the Xenia goal line. It was now 28-26 with 6:33 left to play. Plenty of time for Franklin to stop the Buccaneers’ offense and then rumble downfield for the winning score …. right? Using the ground game that got them the lead in the first place, Xenia gave the ball to Wells eight times, faked to him two other times for big Severt option runs, and pitched to Mickey Penewit one other time, to roll 70 yards down field for Well’s final score of the night. Hayden Falvey booted his fifth of five extra-point tries through the goal posts and the Xenia Buccaneers came away with a well-played 35-26 win. Wells’ 252 yards came on 27 carries. He entered the game listed as second in the Greater Western Ohio Conference with 423 yards rushing, and now has 675 with eight TD runs. Severt completed four of his eight passes for 66 yards and touchdown passes of 16 yards to Brett Russell and then the 22 yarder to Allen. Franklin quarterbacks Braden Woods and Jake Bowermaster combined for 107 yards through the air on 8-for-21 passing with one interception. Wildcat running backs gained 159 yards, with Centers accounting for 97 of those. 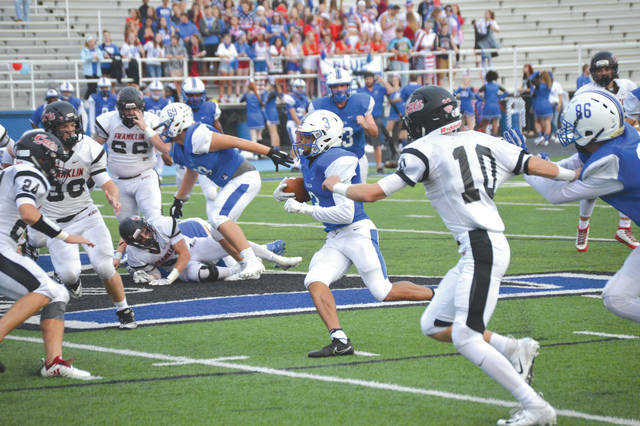 Xenia will host Greenville for it next game at 7 p.m. Friday, Sept. 14 at Doug Adams Stadium, while Franklin gets back into Southwestern Buckeye League Southwestern Division action with a home game that same night against Monroe.